New Hours: We will be closed Saturday 12/21 through Thursday 1/3 for the Christmas holidays so our employees can enjoy their families! 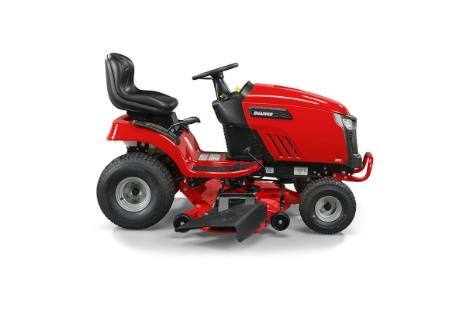 The redesigned Snapper SPX™ Series Riding Mower adds high-value features at a budget-friendly price. Easily maneuver around landscaping with a tight 14-inch turning radius and quick adjust grass cutting height that lets you adapt to your lawn's needs. 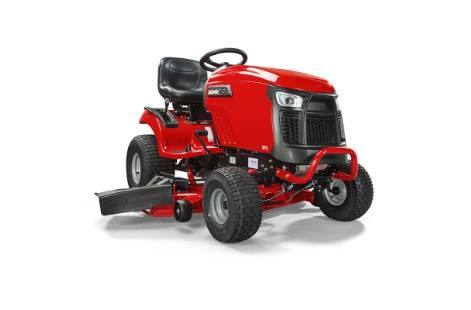 Powered by a Briggs & Stratton Intek™ V-Twin or Professional Series™ Engine, this lawn tractor features OHV (Overhead Valve) technology with a simple-to-maintain design for a more durable engine. Ideal for medium to large yards, the hydrostatic transmission lets you choose the pace. 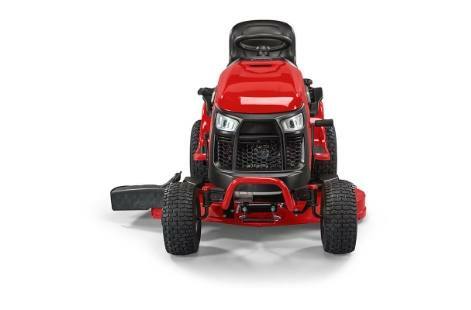 Plus, with illuminating LED headlights, you're able to brighten your path when mowing at dawn or dusk. Step Up to High Value: All-steel construction including the hood, cast-iron front axle and a hydrostatic transmission are hallmarks of SPX™ Tractors. The steel front bumper provides extra durability. A Generation of Power: Briggs & Stratton Professional Series™ V-Twin OHV Engines have full-pressure lubrication and spin-on oil filters for years of trouble-free performance. Quick-Adjust Grass Cutting Height: Easy-to-use height-of-cut controls adjust your mower deck to changing grass conditions. Turning Perfection: With a 14" turning radius, you will spend less time mowing the lawn and more time enjoying your yard. Plus, with a new ergonomic and contoured steering wheel, you can comfortably and confidently navigate your lawn. Step On It: Our responsive foot pedals give you control over forward and reverse lawn mower speed. Dash-mounted cruise control lets you set your mowing speed. Pick Your Mower Deck: The durable 42" and 48" fabricated mower decks feature welded, heavy-duty steel for non-stop mowing season-after-season. All fabricated decks come with limited lifetime warranty**. Other deck options also available. From 11/11/18 to 6/30/19 take advantage of this special rebate savings event. See rebate form for details. Offer cannot be combined with any other offers such as Bid Assist, Equine Program, PPP, Fleet Rebate, etc. Click here for this mower rebate form for complete details, terms and conditions. From 4/1/19 to 4/30/19 take advantage of this special rebate savings event. 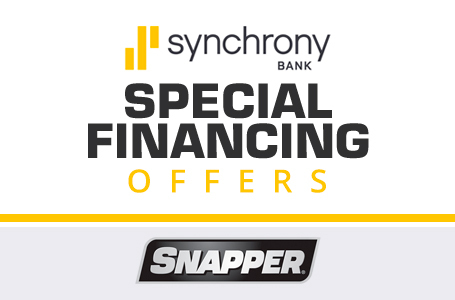 Save big on the purchase of a new Snapper 360Z ($100|Mail-In, $100 Total) (Excludes 2691500,2691499,2691521), 460Z ($200|Mail-In, $200 Total), or 550Z ($50|Instant, $150|Mail-In, $200 Total) (Excludes 560Z) Zero Turn Mowers models in-stock. Instant rebate is applied by the dealer, at the time of purchase. Mail-in rebate will be issued in the form of a Visa® prepaid card by mail. 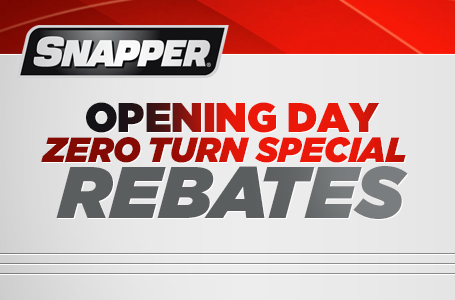 Click here for the Snapper March Madness rebate form for complete details, terms, and conditions. From 4/1/19 to 4/30/19 take advantage of this special rebate savings event. 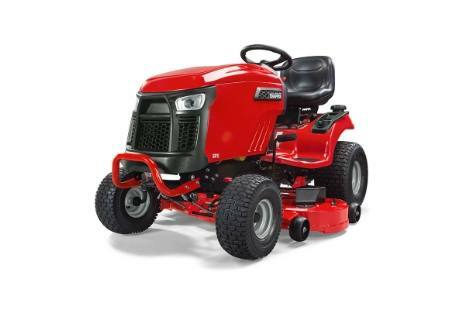 Save $100 (Mail-In) on the purchase of a new Snapper SPX lawn tractor model in-stock. Mail-in rebate will be issued in the form of a Visa® prepaid card by mail. 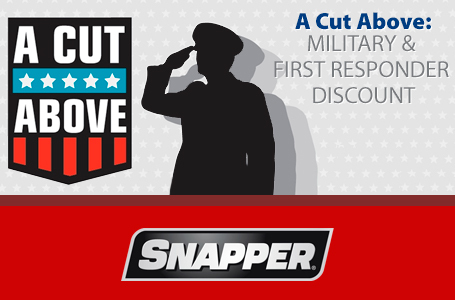 Click here for the Snapper SPX rebate form for complete details, terms, and conditions. No Monthly Interest If Paid In Full Within 6 Months*: On Purchases of $199 or more with your Briggs & Stratton credit card made between 4/1/2019 and 4/30/2019. Minimum monthly payments required. No Monthly Interest If Paid In Full Within 12 Months*:On Purchases of $500 or more with your Briggs & Stratton credit card made between 4/1/2019 and 4/30/2019. Minimum monthly payments required. No Monthly Interest For 24 Months*: On Purchases of $500 or more with your Briggs & Stratton credit card made between 4/1/2019 and 4/30/2019. 24 equal monthly payments required. No Monthly Interest For 36 Months*: On Purchases of $2,000 or more with your Briggs & Stratton credit card made between 4/1/2019 and 4/30/2019. 36 equal monthly payments required. 7.99% APR for 36 Months*: On Purchases of $500 or more with your Briggs & Stratton credit card made between 4/1/2019 and 4/30/2019. 36 fixed monthly payments required. Mow Now, Pay Later, 1.99% for 24 Mos [1.56% APR*]: 1.99% interest for 24 months on your next Snapper purchase. 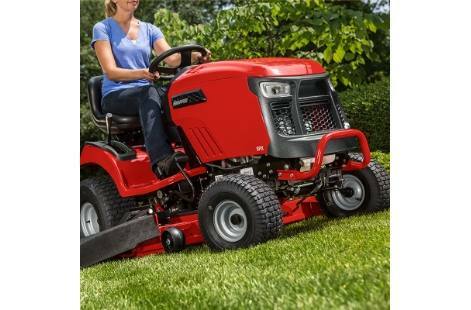 Mow Now, Pay Later, 3.99% for 48 Mos [3.31001% APR*]: 3.99% interest for 48 months on your next Snapper purchase. Sub Prime Program 6.99% for 36 Months [7.43128% APR*]: 6.99% interest for 36 months on your next Snapper purchase. 0% for 12 Months [1.22945% APR*]: Zero interest for 12 months on your next Snapper mower or outdoor power product purchase. 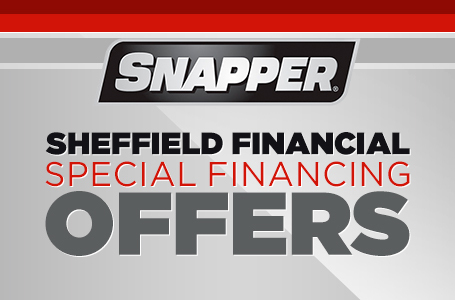 0% for 42 Months [0.37383% APR*]: 0% interest for 42 months on your next Snapper purchase. 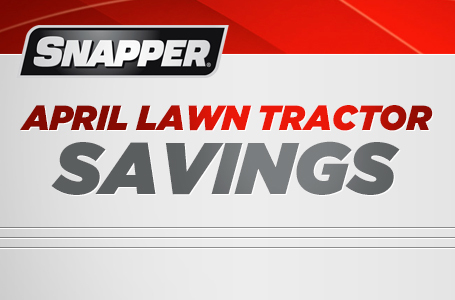 1.99% for 48 Months [2.31604% APR*]: 1.99% interest for 48 months on your next Snapper mower or outdoor power product purchase. 3.99% for 60 Months [4.25540% APR*]: 3.99% interest for 60 months on your next Snapper mower or outdoor power product purchase. 0.99% APR for 12 Months*: On Purchases of $500 or more with your Briggs & Stratton credit card made between 4/1/2019 and 4/30/2019. 2.99% APR for 24 Months*: On Purchases of $1500 or more with your Briggs & Stratton credit card made between 4/1/2019 and 4/30/2019. 3.99% APR for 36 Months: On Purchases of $2500 or more with your Briggs & Stratton credit card made between 4/1/2019 and 4/30/2019. 4.99% APR for 48 Months: On Purchases of $3500 or more with your Briggs & Stratton credit card made between 4/1/2019 and 4/30/2019.